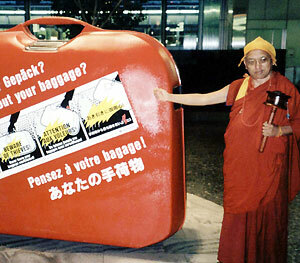 Any center that has hosted Rinpoche knows He travels with a great deal of luggage! 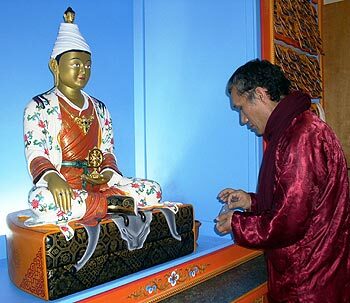 A reminder to all that new pictures of Rinpoche are regularly added to the website. Some of the letters Rinpoche is reading in this picture are the 250 personal invitations he received from students in Mexico. who killed this year’s turkeys will be reborn as turkeys in future and killed under similar circumstances. Perhaps as soon as next Thanksgiving, some of them will be eaten. Turkeys are so powerless. If they could, I’m certain they’d demonstrate strongly against the humans who kill them. But if they did they’d probably get killed for that as well. Rinpoche has advised: “When there are fires the best thing to do is rely on the Medicine Buddha, to do Medicine Buddha puja. 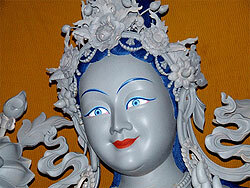 Medicine Buddha practice can also be done for anyone who is sick, dying or even who has already died. This is the best practice to do. On the back page of the Feb/March issue of Mandala magazine, you will find the Heart Mantra of Arya Vairochana in colour, designed by Rinpoche – Rinpoche thought that people can cut it out and frame it, as just displaying it in your home is a method to prevent fires. Read Ven Holly Ansett’s story of how the mantra came to be designed and the subsequent fire in Rinpoche’s house. Maintaining the total number of FPMT centers, study groups, projects and services worldwide to 152! Sadly, Hayagriva Center in Taoyuen, Taiwan has closed. With grateful thanks to all whose time, energy and donations enabled the center to benefit beings. In 2000, Lama Zopa Rinpoche asked Chenrezig Institute to host a one hundred million Mani mantra retreat, in which the collective recitations from all participants would be added together to make 100,000,000. Chenrezig Institute has been hosting this retreat each year, in the form of a residential retreat and an at-home practice. Would you like to join their at home practice this year? “I am very, very happy to hear the Mani retreat is going ahead. This will definitively bring peace and happiness to all sentient beings, especially peace to this world. It is really a great thing to do, it is really great that this is happening; my prayers and big love are with you all. This year’s formal Mani Retreat will be held from February 26th to March 17th. For more information, email spc@chenrezig.com.au. The retreat commenced in November and will continue until Saka Dawa on June 18, 2008. In his great kindness and aware of our extremely busy lifestyles, Lama Zopa has composed a short practice available to anyone who wishes to participate in the retreat from the convenience of their own home. Participants from abroad may register a pledge by emailing spc@chenrezig.com.au . This also means that it doesn’t matter where you live in order to join us! If you can spare 20 minutes per day, ten of those minutes you may wish to spend on the practice and another 10 on reciting the OM MANI PADME HUM mantra. If you feel comfortable to do so, you may pledge a specific number of mantra recitations on a daily basis. Once you have registered or expressed interest via email the short practice will be emailed or posted to you. Generally speaking this practice can be done quite quickly and then time can be spent on the recitations, followed by the dedication. We currently have short biographies for our Touring Teachers listed – we would love to have short bios for our wonderful resident teachers too! Please send these to Claire. Read the full advice in the FPMT Affiliates Area. The practice of Namgyälma removes obstacles to long life and brings powerful purification for all sentient beings. 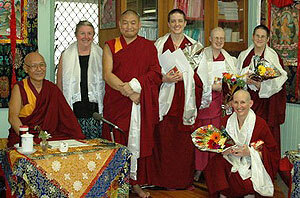 Geshe Tashi Tsering with Chenrezig Institute’s Basic Program graduates. December 2007. Program graduates who have successfully completed the entire BP, including retreat and final exam. At ILTK another 6 students received their BP Homestudy certificate. The next BP final exam is planned to take place in 2009. And…the Basic Program goes Czech! BP graduate Ester Bilkova translates the BP texts into Czech and will be Teaching Assistant for the on-line forum, while TA Ven. Kevin Middleton, BP graduate and MP student, will visit regularly to lead short retreats and review weekends for the five year Basic Program homestudy course offered by Czech Republic’s Dompipa Study Group, starting in January. The latest issue (Feb-March 2008) is now out with a lengthy feature on the life and death of Geshe Jampa Gyatso, who died in November. This amazing geshe is much missed, but what a wonderful legacy he leaves behind for his devoted students at Istituto Lama Tzong Khapa and graduates of the Masters Program. Remember that Mandala is a means of communication between not only FPMT centers and students but for people everywhere. In future issues you will read about how this affects you, and how you can be involved in the ever-increasing circle that is our community. Now is the time to become a subscriber – by doing so you are helping Mandala to grow and, at the same time, you are ensuring that you are kept up-to-date with some exciting developments. Meanwhile, we know there are many people out there whose sterling work for the Dharma needs to be recognized. They are never going to push themselves forward, but you know who they are: perhaps it’s a veteran Geshe or FPMT teacher, a center staff member, or a friend of FPMT who is giving great service. Our series called “The Giving Tree” is the opportunity to let the rest of us know about the bodhisattvas in our midst. Contact the editor@fpmt.org and let Mandala publish the story of their unsung achievements. THANK YOU to everyone who has already submitted their Merit Box Donation for 2007. There is still time to send in your donation. You can go to the Virtual Merit Box and make a credit card donation or see our collection information page for more options. Remember; please do not send cash through the mail. In addition, all center directors and center based Merit Box coordinators, remember that January 15, 2008 was the deadline to complete your requests for projects to be considered as part of Lama Zopa Rinpoche’s distribution of funds for 2007. If you have not sent in your application, please do so immediately. Just email it to meritbox@fpmt.org. Thank you again to everyone who has submitted their Merit Box donations and applications. Thank you to all the centers who have confirmed that they are reciting Diamond Cutter Sutra for Ecie Hursthouse, as requested by Rinpoche. Ecie’s family has a very detailed blog about her condition. As you may have seen recently in the August edition of Mandala magazine the large statue of Green Tara that is being made by Bertrand Cayla at Lama Zopa Rinpoche’s request for Osel Ling in Spain, is at the stage of near completion before being cast in bronze. Lama Zopa Rinpoche is very happy with the art of this statue, so if any center is considering a Tara statue, do consider this one. Julie Brown, Coordinator of Tara Projects, writes, “The project goes back to 2001 and has taken longer to realize than expected, but certain changes along the way have opened unexpected doors, namely a better material to cast the statue and the potential for more statues to be made. Bertrand always conceived his design of the statue with the possibility of having moulds made to allow it to be copied and cast, but originally that was just for Osel Ling’s commissioned statue. included, by sharing some of the original creation costs and mould making costs. This we hope will also give us a sound base to invite outside investors and sponsors to contribute to some of the grosser expenses. So now we are able to offer the possibility of accepting requests for the statue from other centres and practitioners. The estimated cost of a bronze cast of the statue is around 50,000 euros plus transport/shipping from the foundry in Spain. We can put together a more comprehensive budget, as we have for Osel Ling, to cover the broader costs of setting up on-site and gold leaf finishing, etc. More information about this statue and the fundraising so far are on our website which has pages in English, French and Spanish. A very useful contribution would also be a link to our website from fellow sites to help us reach a wider audience. The feedback we have had so far has been so encouraging, we would really like to take the offerings and enthusiasm of the current sponsors/donors and make their contribution count by realizing this and other statues soon! New Opportunities include spiritual program coordinator at Atisha Centre, Australia; Milarepa Center in USA is looking for volunteers.